The Mantell UFO incident where captain Thomas F. Mantell got involved in belongs to one of the most important and popular UFO sightings. Especially becouse the encounter with a UFO ended in the death of a fighter pilot that changed the public vision about UFOs entirely. It all begins when the Kentucky State Highway Patrol gets a telephone call about at the 7th of january about an unknown object of about 90meters wide that hovers above Maysville moving west. The reports were send to the Military Police and got under the attention of Colonel Guy F. of the Godman Army Airfield on the Fort Knox US Army post in Hardin county, Kentucky. The airport staff observes the unknown flying object for nearly 90 minutes but nobody could identify the object. Eyewitnesses from the vicinity of the military airport described the object as immobile or very slowly shifting. At around 02:45pm 4 F-51 Mustang fighter planes leave for the area the UFO was spotted in. 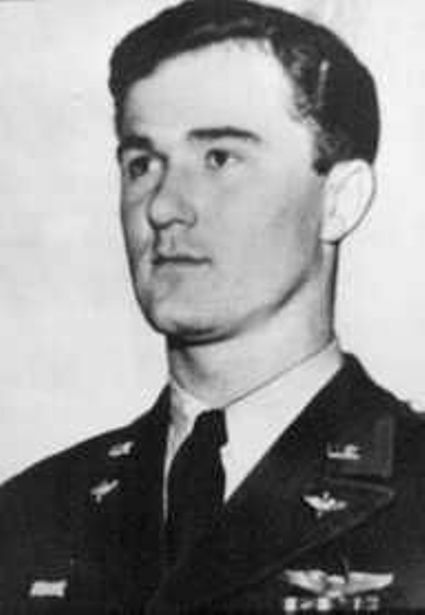 Captain Thomas F. Mantell was ordered to identify the unknown flying object. 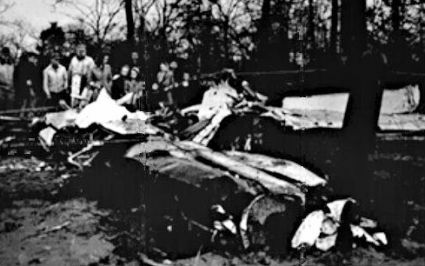 The object was at much higher altitude then fighter planes so they had to gain some… at a hight of 22.500 feet 3 of the 4 planes have to abort the persuit becouse of low fuel and oxygen levels. Captain Mantell got instructions to cancel the persuit, but he kept climbing. There has been some disagreement about the last words of radiocommunication just before the fatal crash. Some of the airport staff say that Mantell discribed the object as “Metalic and incredibly large”. Others quote his last words as “It is right above me and seems to move at half my speed”. 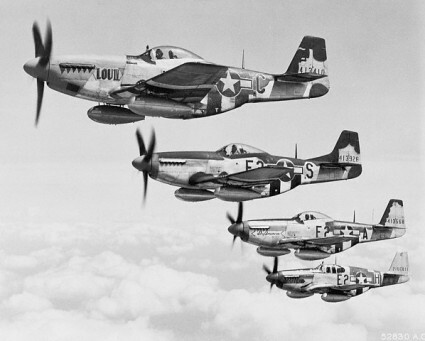 The F-51 Mustang of Captain Mantell was last seen climbing for higher altitude. Becouse he didnt have the plane capable of supplying him of enough oxygen he probably got passed out. That what caused his airplane to spin and crash moments later on a farm near Franklin. Mantell was found a couple of hours later on the crashsite. At that point the UFO was gone. 1. The plane fell apart before it hit the ground. This is the normal result of a plane that flys way above its designed maximum, but for witnesses its simple to misinterpret the scattering of the airplane. 2. The plane crashed down horizontally, not with the nose down as many people think it should. Despite a lack of evidence – not to say there is none – this was an excellent base for wild conspiracy theories and cover-up. The Skyhook weather balloon project was top secret, nobody involved in the observation knew about it. A number of skyhook weather balloons were released earlier that day in Clinton County, Ohio at about 240 kilometers from Fort Knox. The appearence and the behaviour of the UFO matched with that of a weather balloon: made out of reflecting aluminium and about 30 meters in diameter. The Mantell UFO incident changed the public opinion about UFOs. Where we used to look at UFOs as a light form of entertainment was the Mantell UFO incident announced by alarming headlines such as ‘Pilot dies in persuit of UFO’ or ‘Flier Dies Chasing A Flying Saucer’ - The New York Times. 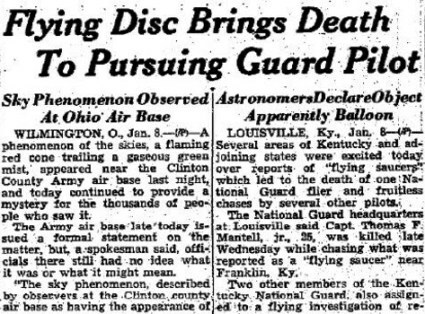 From this incident on we start assuming UFOs could be dangerous. The UFO phenomenom got an irreversible hostile and bitter aftertaste. For decades people from different backgrounds report that they have seen 'strange objects' flying through the sky. Some of these people even managed to capture one on a photo or even a live video. In many cases this results in .